Are you ready……to let your soul shine? Reflexology is an ancient, safe and effective holistic therapy which activates the body’s own natural healing abilities, and seeks to bring all systems of the body into balance. A reflexologist is trained to use a series of special pressure techniques to soothe or stimulate reflex points on the feet, face or hands which correspond to all the structures, tissues, organs, glands and systems of the body. During the treatment, the reflexologist is able to discern areas of imbalance within the body and effectively treat them in order to restore balance and well-being to the client. I will invite you to recline on the therapy couch, where you will be fully supported with as many pillows and cushions as you need to get super comfy. Next I will offer you a cosy blanket to cocoon yourself in…and then your blissful treatment begins. You need only expose your feet and lower legs for a reflexology treatment, and I start by wrapping your feet with steamy hot towels to cleanse and to relax tired muscles. I then work on balancing the reflexes of your feet with pressure techniques as you drift off on a cloud of tranquility, enjoying the serene music, the calming scent of essential oils and the soft glow of your candlelit treatment room. The Association of Reflexologists, of which I am a a member, have produced this short video to help explain Reflexology. The Association of Reflexologists have been the foremost independent Association for Reflexology in the UK since 1984. Reflexology is not a therapy used to diagnose illness. It is not a medical treatment and does not cure, instead it facilitates healing within the body. Although reflexology works very well alongside conventional medicine, it should never be used in place of seeking professional medical advice. If you have any concerns about your health please always consult your doctor in the first instance. Facial Reflexology delivers all the well-documented health and well-being effects of traditional foot or hand reflexology, but with the exciting added benefit of providing a rejuvenating transformation of your skin. This added bonus is due to the sculpting and lifting of your facial muscles that takes place during the treatment, which enhances your complexion. You are likely to notice a brighter glow from your very first appointment! Additionally, facial reflexology is able to induce a deep state of relaxation in the recipient. This is due to the proximity of the facial reflex points to the brain and central nervous system. The manipulation of facial reflexes sends soothing messages directly to the body’s neuro-pathways, which means that the relaxing effects of a facial reflexology treatment are deep and instantaneous. I specialise in the Bergman Method of Facial Reflexology at my treatment room, and completed my training at the London School of Reflexology under the watchful eye of Ziggie Bergman herself. Ziggie created this wonderful method of facial reflexology by blending Native American techniques, Asian body maps that chart the reflexes of the face, and reflexology Zone Theory. The result is a sophisticated treatment which delivers all the therapeutic benefits of a holistic therapy with a touch of beautifying luxury. I will invite you to fully recline on the therapy couch, where you will be covered in a cosy blanket. I will gently cleanse and relax the muscles of your face with hot towels before applying your choice of rose, frankincense or orange flower organic facial oil. During the treatment I will use gentle pressure to stimulate different reflex points on the face, I also incorporate a range of massage and natural facelift techniques which smooth any wrinkles and rejuvenate the skin. I work at a much slower, more gentle and soothing pace during a facial reflexology treatment due to the fragile nature of the skin; this means that most clients find this treatment extremely relaxing, and many even drift off to sleep! At the end of the treatment I will share my findings with you, and give you some recommendations such as specific reflex points that you can work on at home. My aim is for you to leave experiencing a sense of inner calm, a deep feeling of well-being and benefiting from a glowing and rejuvenated complexion. I am proud to use Neal’s Yard products in my Facial Reflexology treatments. Since it’s inception in 1981, Neal's Yard Remedies has been a pioneer in organic beauty and well-being. Their products are never tested on animals and their ingredients are always sustainably and ethically sourced. If you fall in love with the products I use during your treatments, why not treat yourself so that you can recreate that spa sensation at home? Just click on the logo to be guided to my Neal’s Yard Remedies Organic Shop web-page. At Transcendence Holistic Therapies, every treatment I offer delivers benefits to body, mind and spirit, and my signature facial epitomises this holistic approach to health, well-being and beauty. The Divine Ritual Holistic Facial is a luxurious treatment that nurtures both your skin and your soul, leaving you feeling good and looking amazing naturally. A good Holistic Facial goes beyond the traditional skin care treatments of the Beauty Salon, offering another layer of care to the client by using specially selected organic skin care ranges, and by treating the client as a whole rather than just focusing on their skin issues. However, with my training in reiki and reflexology, I knew that I could push the boundaries of the standard Holistic Facial model into something truly transcendent, which is how the Divine Ritual Holistic Facial came to be devised - as the ultimate Facial experience to care for both my clients’ skin and their well-being. The Divine Ritual Holistic Facial follows a luxurious skin care journey that encompasses a Double Deep Cleanse, Steam Towels, Exfoliation, Face Mask, Facial Massage, Lymph Drainage, Scalp, Neck and Shoulder Massage, Tone & Moisturise. l use only Neal’s Yard Remedies award-winning organic Skin Care ranges during the treatment, which will be selected to complement your specific skin type during your pre-facial skin-care consultation. This cosseting and results-driven facial treatment is then taken to the next level by the incorporation of tools from the Holistic Therapist’s Treasure Chest. I include facial reflexology within your facial massage to remove blockages within your meridians, I flow reiki energy during your scalp massage to balance your chakras and cleanse your aura, and I harness the ancient healing power of crystals throughout your facial experience. Wands of rose quartz, spheres of clear quartz and gua sha tools of jade all bring their unique soothing energies to your facial massage, raising your vibration and transporting you to a blissful state of pure relaxation where stress and tension simply melt away. The Divine Ritual Holistic Facial is a complete treatment for both your skin and your well-being, promoting a feeling of infinite peace within your soul, while generating a serene, luminous glow to your skin. It’s the ideal regular monthly treatment to expertly purify, polish, tone and nourish your skin whilst caring for your precious mental and emotional well-being - soulful skincare at its very best. ~ Purifying Palmarosa for Oily Skin Types. Many clients find this treatment so relaxing that they drift off to sleep during their hour on the therapy bed, and why not? This is your time to restore and revive body, mind and spirit. I guarantee that if you do drift off, you will awake to cleaner, brighter and younger looking skin, and a new found feeling of serenity. I am proud to use Neal’s Yard products in my Holistic Facial treatments. Since it’s inception in 1981, Neal's Yard Remedies has been a pioneer in organic beauty and well-being. Their products are never tested on animals and their ingredients are always sustainably and ethically sourced. If you fall in love with the products I use during your treatments, why not treat yourself so that you can recreate that spa sensation at home? Just click on the logo to be guided to my Neal’s Yard Remedies Organic Shop web-page. What is ZONE FACE LIFT? Zone Face Lift is a brilliant new facial treatment that is being hailed by many as a credible, all natural, alternative to Botox. This innovative anti-ageing treatment was developed by Reflexologist and Facialist to the stars, Ziggie Bergman. Ziggie created this specialist facial treatment after spending years practicing reflexology and studying with Native American Shamen and Healers in New Mexico. 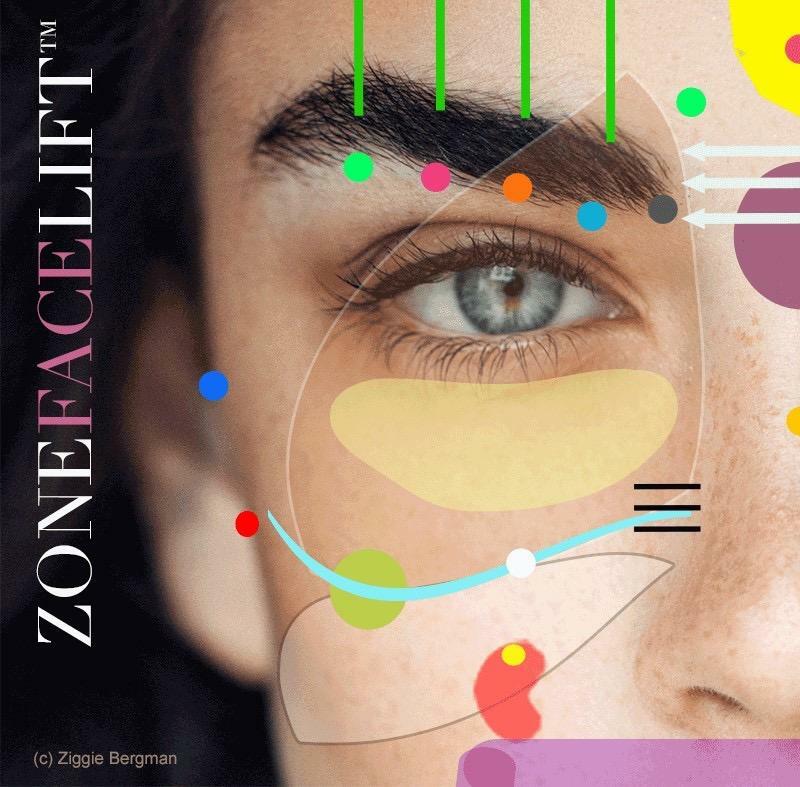 Zone Face Lift blends classical facial reflexology, Asian body mapping, ancient Shamanic healing techniques, Japanese Facial Massage, Crystals and Gua Sha into the most transformative, non-invasive natural facial treatment available. I am privileged to have learned the specialist techniques that are required to deliver this unique treatment under Ziggie Bergman’s own tutelage at the London School of Reflexology, and am so excited to be able to bring this amazing treatment back to share with my own clients at my treatment room in Horbury, Wakefield. Zone Face Lift truly is the most luxurious, transformative and healing Facial Treatment that you could ever wish to receive. Each Zone Face Lift treatment is unique and tailored to exactly what your spirit and skin requires on the day of your appointment. The foundation of each 80 minute treatment is Facial Reflexology, Pressure Point Massage, Japanese Facial Massage Techniques and Gua Sha. A combination of tools such as quartz crystal spheres, rose quartz wands, jade gua sha and acupressure rollers will be used in the massage sequence according to your skin’s needs. Although the facial massage techniques are stimulating in order to enhance your complexion, most clients find the treatment extremely soothing and many drift off to sleep. My aim is always for you to leave your Zone Face Lift treatment with a soothed soul, a life-affirming glow and a noticeably rejuvenated complexion. Should you choose to experience a 6 or 12 week programme of Zone Face Lift treatments, you will embark on a very special transformational journey that will naturally lift your skin and your spirit. Absolutely perfect in the run-up to a wedding or any special event in your life. I use the multi-award winning, crystal infused Zone Face Lift Facial Elixir within your Zone Face Lift Treatment. This divine facial oil recently beat the likes of Dior and Ren to win “Best Face Oil/Serum”at the 2018 Beauty Shortlist Awards and the Janey Loves Platinum Awards. The Elixir was developed by Ziggie Bergman to enhance the therepeutic and beautifying effects of Zone Face Lift Treatments and even contains White Sage oil to “smudge” negative energy during your treatment. Clients who book the 12 week Zone Face Lift programme will receive a complimentary bottle of this precious Elixir in order to maintain their skin care routine at home. Reiki (pronounced Ray Kee) is a safe, gentle and non-intrusive healing technique which channels Universal Life Force Energy. It was developed by a Japanese Buddhist Priest, Dr Mikao Usui, in the early 1900s. It uses spiritual energy to treat physical ailments without the use of pressure, massage or manipulation. Reiki energy is said to help re-balance the whole person in mind, body and spirit and its gentle nature means that Reiki is a suitable therapy for all ages. Each person experiences Reiki differently depending on their individual needs at the time. Helps you to cope in physically or emotionally difficult times. I will invite you to fully recline on the therapy couch, where you will be supported with as many pillows and cushions as you need to feel comfy and relaxed. Next I will cover you in a comforting blanket so that you can lie back cocooned in warmth whilst enjoying the tranquil music and soothing essential oil scents of your treatment room. As reiki is a gentle, non-invasive therapy, you will remain fully clothed throughout your treatment whilst I place my hands on or near various parts of your body including the head, torso, knees and feet in order to channel the energy to you. There are also a number of specific areas (chakras) that directly affect the energy systems of your body which I will work on during your treatment. Everyone responds differently to Reiki, and recipients may or may not feel sensations during their Reiki treatment. Some people report sensations of tingling, heat, or experience seeing colours. For others their response is emotional, indicating that shifts are taking place, allowing harmony to be restored. Reiki is not a therapy used to diagnose illness. It is not a medical treatment and does not cure. Although Reiki is often used alongside conventional care in hopsices, hospitals and other healthcare settings, it should never be used in place of seeking professional medical advice. If you have any concerns about your health please always consult your doctor in the first instance. Zone Face Lift can be enjoyed as a standalone treatment, but is designed to be experienced as a 6 or 12 week journey. Book a programme of 6 weekly treatments and only pay for 5 (£375 - saving £75). Book a programme of 12 weekly treatments and only pay for 10 (£750 - saving £150). Clients booking on the 12 week programme will also receive a free bottle of the Award Winning Zone Face Lift Elixir (RRP £75) and crystal Gua Sha tools to maintain their skin care practice at home. For all first appointments, please allow an additional 10 minutes so that we can complete a health and well-being assessment to better understand your needs. What are you in the mood for today? Combine any of the above into your ultimate bespoke package. Just let me know your preferences. Please check your policy details carefully to see if you are covered, and let me know so that I can have a receipt ready for you. Let’s celebrate Springtime! from the Spring Equinox on March 21st until the end of May, I am offering the unique and ultra-luxurious Zone Face Lift treatment at only £50 (usual price £75). Spring clean your Skin and your Spirit with this beautiful treatment, hailed in the Press as the “Spiritual Facial” which “Naturally Lifts your Face and Spirit”. A gorgeous blend of Japanese Facial Massage, Gua Sha and Facial Reflexology, this anti-aging treatment really is the ultimate indulgence - 80 mins of pure relaxation that expertly revives and rejuvenates whilst you drift off on a cloud of pure bliss! ~Not valid in conjunction with any other offer. A Warm Welcome to Transcendence Holistic Therapies, a tranquil retreat from the stresses of the modern world. Put your feet up, turn your phone off, and re-connect with the wonder of you! I understand that your free time is precious and limited, so it is my sincere aim for you to enjoy every second that you spend here. From the moment you lie back on the softly cushioned therapy bed, to the blissful stress release of your reflexology or reiki session, to the closing moments of your treatment when you slowly open your eyes and float back down to earth - everything I do is with your comfort and relaxation in mind. Vicky is a Clinical Reflexologist, Holistic Facialist and Reiki Master in the Usui System of Natural Healing. She is passionate about the benefits that her therapies can bring, not only in treating specific ailments, but also in generating an improved sense of well-being whatever the client’s age or circumstances. She is trained to the highest possible reflexology standard in the UK, having been awarded the Centralia Level 5 Clinical Mastership in Reflexology. She studied at Jubilee College under David Wayte who is a Fellow of the Association of Reflexologists and the only reflexologist in the UK to be made a member of the Royal Society of Medicine. She is a full member of the Association of Reflexologists, and the Federation of Holistic Therapists. Let’s stay in touch! Sign up with your email address to receive news of special offers and updates. Are you ready to feel Transcendent? Please drop me a line to book your treatment, or to contact me with any queries, I am always happy to hear from you. You can also call or text me on 07917 718858. If I don’t pick up straight away it’s because I’m looking after a client in the Treatment Room. Don’t worry though, I will get back to you as soon as I’m free. Are you ready to make time for you? Now is the time to prioritise your precious health and well-being. Curious to see what my clients are saying about the treatments that I deliver? Just click on the Facebook icon below and open the Review page. I look forward to welcoming you to Transcendence Holistic Therapies very soon.